The pencil-thin house slices through the top of the hill, Michael Heizer-style, leaving the surrounding hayfield virtually untouched. This surgical slice through the hill allows the house to be one story high at the center where the living spaces are, and two stories at the extremes, giving access to the basement garage and two-story guest house. 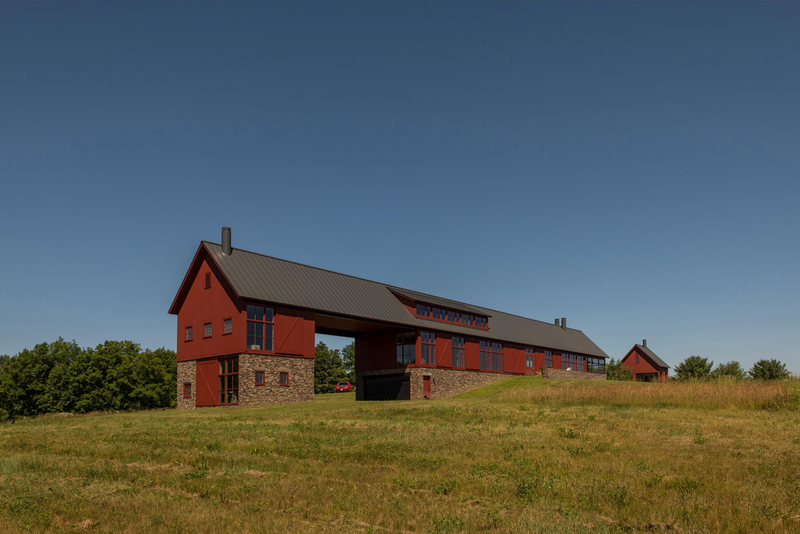 We took our inspiration for materials and form from the architectural language of local farm buildings with sloped soffit eaves, red vertical siding, stone foundation, and barn sash windows. We pushed the barn form to unusual limits, stretching the length to 300’ and squeezing the width to 24’. Then we cut away 40’ off the structure beneath the roof to allow an entrance to the lower level garage and guest house. Near the northern end we omitted the roof and walls for 83’, retaining the stone foundation for a raised terrace and pool, eliminating the need for a pool fence. The elongated plan allows every room to enfront the spectacular eastern view while minimizing northern exposure. 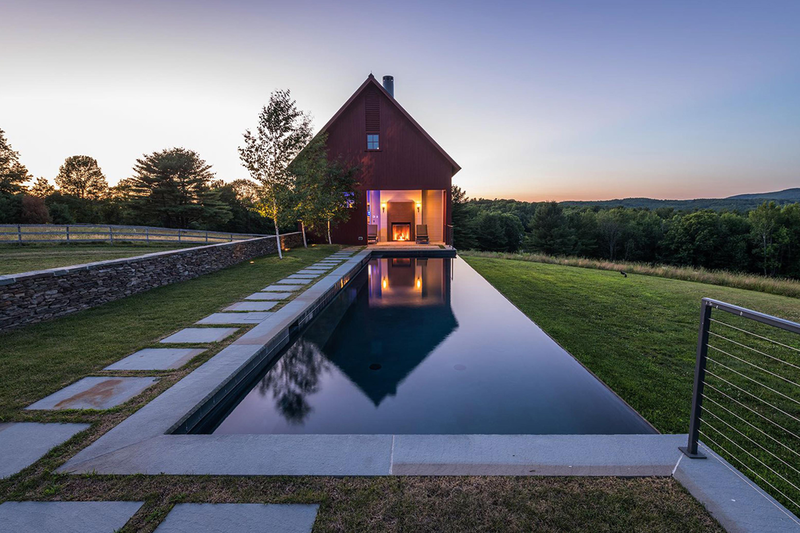 The east and west elevations are composed entirely of windows and the barn doors which slideto cover them when the owners are away. 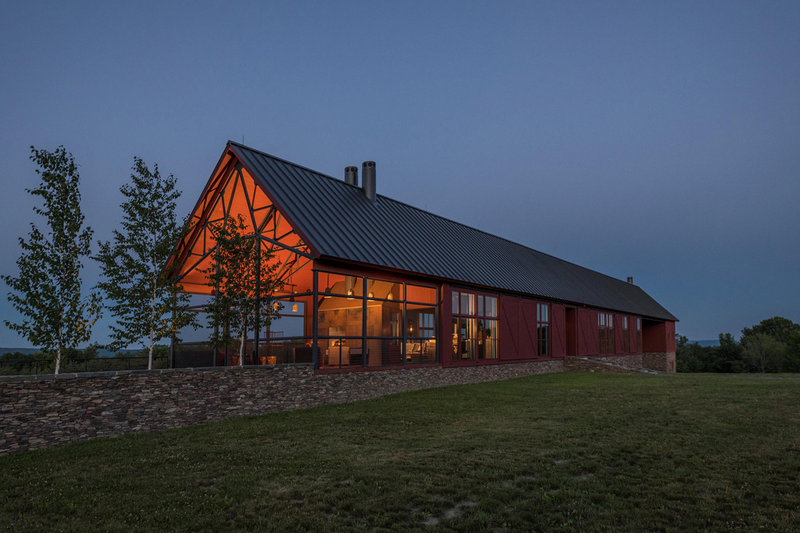 We designed the trusses to eliminate the usual space-lowering horizontal beam, with two standard triangular trusses set against the ceiling, connected with steel rods. In the living room, this motif is executed in Douglas fir with steel gusset plates. On the screened porch the same design is built of more delicate steel. 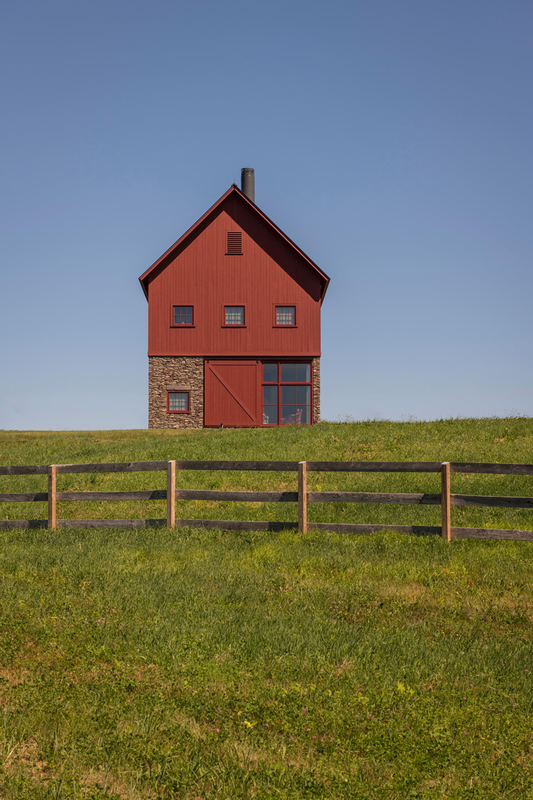 The final project sits tightly in the land, preserving and honoring the agrarian heritage of the area.